Please speak with your event specialist with regards to what size tent is best suited for your event. The many factors that will determine the size of your tent include: Size of dance floor, buffet(s), bar(s), stage, rectangular or round tables, and much more. Use our handy tent calculator to help you determine the size tent you need. The pole tent, as its name suggests, is supported by poles and ropes utilizing tension to create graceful curves and peaks marked by the absence of framework. Beautiful and elegant, it is a truly sophisticated choice. Since pole tents must be staked into the ground, as they are tension secured, they cannot be set up on concrete or other hard surfaces. * Pole tents are available in a large variety of sizes. The most popular sizes are shown in our online rental catalog. If you are interested in a different size or configuration, please ask your event specialist. *Asphalt staking may be accomplished with the use of additional tools/machines. Additional charges apply. The ultra-modern Capri is a fresh, innovative, and elegant way to transform any backyard into a stylish party atmosphere. The Capri’s spacious design is dramatically different than any other canopy-style tent on the market today. The unique design allows for fewer stakes, poles, and ropes, which means smoother movement within and around the tent. Whether it be protecting you from the UV rays of sunshine, raindrops, or a chilly evening breeze, the festive styling of a Traditional Pole Tent gets any event started and keeps it going! With the exquisite styling and beauty of a larger tension tent, our traditional pole tents are smaller, slightly shorter versions of our Evolution Tents, still maintaining peaks at the center poles for spacious interiors, and superior air circulation. Beauty meets expandability — the Evolution Tent is the most spectacular tension tent in the industry. With tall elegant peaks, sweeping lines, and roomy interior, it is constructed to accept many of your favorite "large tent" accessories — ceiling drapery, 8’-tall sidewalls, sidepole and centerpole skirts, etc. The twin center poles lend themselves to a central aisle, while creating endless options for transforming the space to reflect your vision. Thanks to military technology, the Evolution is a winning combination against mother nature with increased roof pitch and rugged vinyl tops (wind rated to 76 mph!). Frame tents are characterized by a completely unobstructed interior (no center poles! ), a minimum of sidepoles, and no "off-shooting" perimeter ropes. They can be used anywhere, but are especially ideal for placement on solid surfaces (e.g. concrete, asphalt, deck, patio, etc.). Frame tents can be weighted* or screw-eye mounted* instead of staked through the ground. For years, our clients wished for a Frame Tent (without the obstruction of a center pole), paired with the pretty, tall peaks of a Traditional Pole Tent. 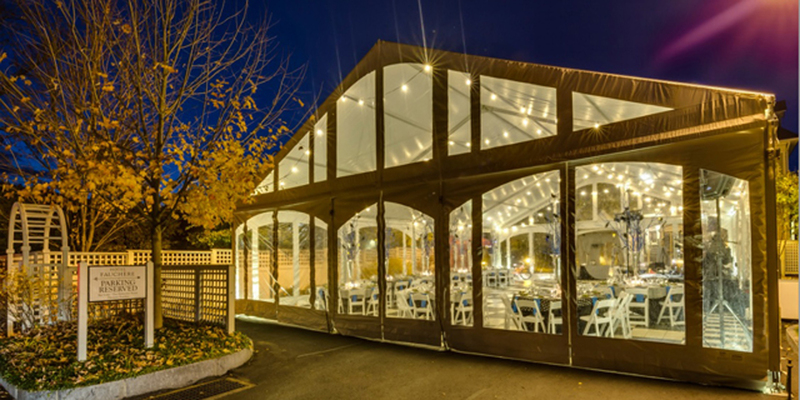 The Vista Tent was created to accomplish this, and the "flying center pole" (which rests on tension cables above the heads of your guests) has revolutionized the entire industry! Traditional elegance meets superior strength with the Traditional Frame Tent. These fully engineered temporary structures feature an unobstructed interior space accomplished through an assembled framework of steel brackets and aluminum poles, making these tents suitable for larger or longer-term applications. "Span" (a.k.a. "Structure") Frame tents are characterized by a completely unobstructed interior with the ability to rig truss and other substantial lighting, special effects, and A/V equipment. E!Span Frame Tents are the most superior, safe frame tent in the industry, with standard 10’ perimeter height and 22’+ ceiling heights, and engineered to withstand 90mph wind capacity. Span tents make use of a track-style vinyl system for the most comfortable temperature controlled (heated or cooled) environment. Our E!Span tents can be used on any level* surface, and are especially perfect for placement on solid surfaces (e.g. concrete, asphalt, deck, patio, etc. ), as they can be weighted* instead of staked through the ground.